Despite a dearth of monitoring and law enforcement in the remote Saya de Malha bank, there’s nothing secret about what’s going on in this distant area of the Indian Ocean east of Madagascar. Last month, Greenpeace published a report asserting that a significant number of Thai fishing vessels have repeatedly moved their operations, which were shown to include illegal fishing and human trafficking, to evade detection and capture, and that they may now be acting with impunity on the Saya de Malha bank more than 7,000 km from their home port in Thailand. As we know, seeing is believing, and in collaboration with DigitalGlobe, we have obtained high-resolution satellite images that corroborate Greenpeace’s assertions and reveal just how active the fleet is. Since November, we have documented Thai vessels gathering in one specific location on the Saya de Malha bank for the apparent transfer of fish. The report, “Turn the Tide: Human Rights Abuse and Illegal Fishing of Thailand’s Overseas Fishing Industry,” outlines the Thai fleet’s exodus: first from their staple fishing grounds in Indonesian waters to a remote region off of Papua New Guinea, then to the Saya de Malha Bank. The evasive moves correspond to the hardline stance against illegal fishing by Indonesia in 2014 that included blowing up illegal vessels, and to subsequent increases in enforcement by Papua New Guinea in August of 2015. The imagery we’ve captured from Saya de Malha Bank is part of a larger effort to gather high resolution satellite imagery of ocean surface around refrigerated cargo vessels in different parts of the world. With their large carrying capacity, these refrigerated vessels, called “reefers,” collect catch from multiple fishing vessels for transport to shore. Not only does this type of transshipment allow the fishing fleet to continue working the fishing grounds for months, or even years at a time, but it facilitates the mixing of legal and illegal catch, which is why it is prohibited in many circumstances. What’s more, fishing vessels that remain at sea almost indefinitely have greater potential for abusive labor practices, including the enslavement of crew. The move by the Thai fleet to Saya de Malha almost requires the use of reefers as an efficient way of transporting catch to the home port from such distant fishing grounds. 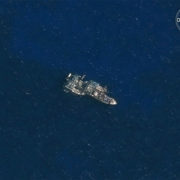 Using AIS signals from known reefer vessels, we identified precise locations for aiming DigitalGlobe’s satellite sensors. 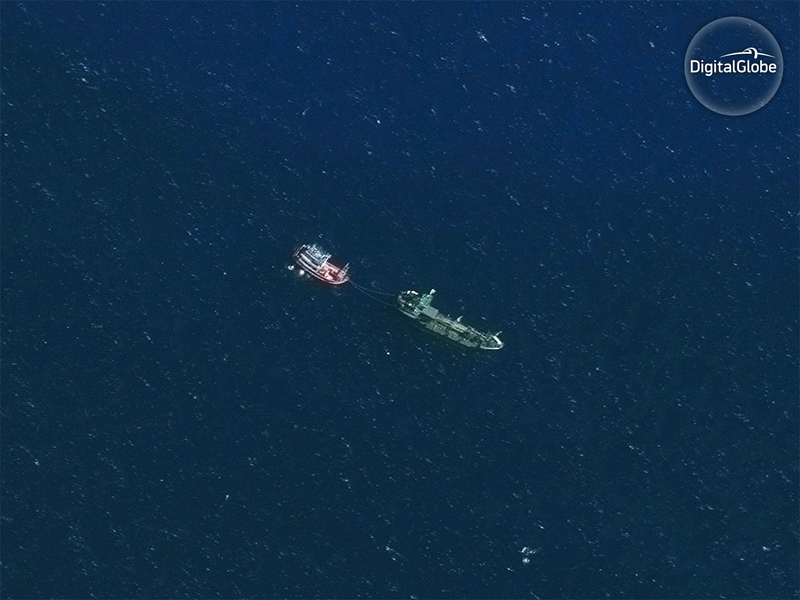 With the knowledge that fishing vessels often don’t broadcast AIS while engaged in illegal activities such as unauthorized transshipment, we were interested in finding out if we could capture suspect vessels using imagery in the vicinity of a reefer. 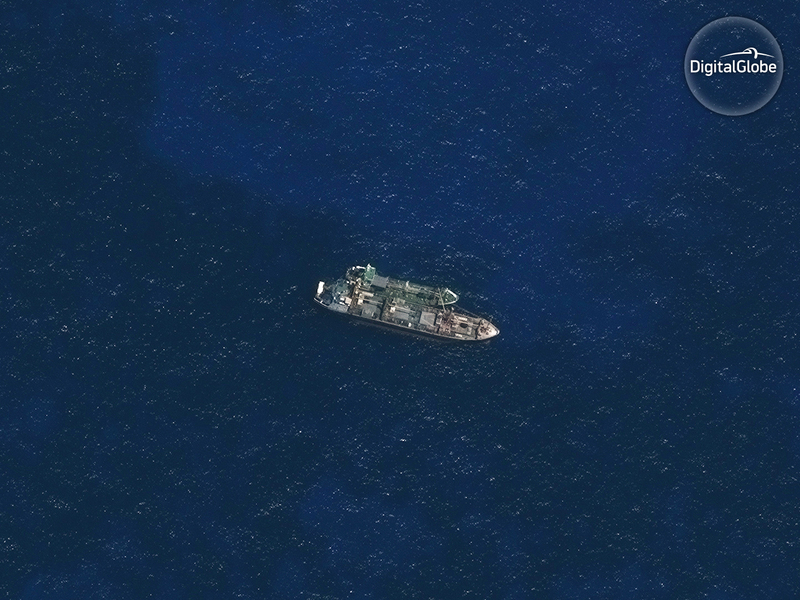 One of the reefers we chose for imaging, the Thai vessel Leelawadee, seemed a good target. “I saw that it was stopped at the north end of the bank,” says our analyst Bjorn Bergman. “It’s in a location where it may be shallow enough to anchor.” In addition, Bjorn had documented a possible transshipment between the Leelawadee and an unnamed vessel in 2015. That event was documented using AIS data as part of SkyTruth’s assistance with the investigation by the Associated Press into Thai vessels fishing with trafficked and enslaved crews. It is no surprise that it occurred in the waters of Papua New Guinea. The first image of Leelawadee on the Saya de Malha bank was captured on Nov 23, 2016. It showed her alongside a refueling vessel, the Mahachai Marine 1. Refueling at sea, also known as “bunkering,” is another necessity for fishing vessels operating far from their home ports for extended periods of time. Seven days later, on the November 30, the satellite captured five vessels in one pass: the Leelawadee with two vessels tied alongside her and a vessel tied to the stern of the Mahachai Marine 1 (see images below). Although the three unknown vessels appear to be fishing boats, none were broadcasting AIS signals. 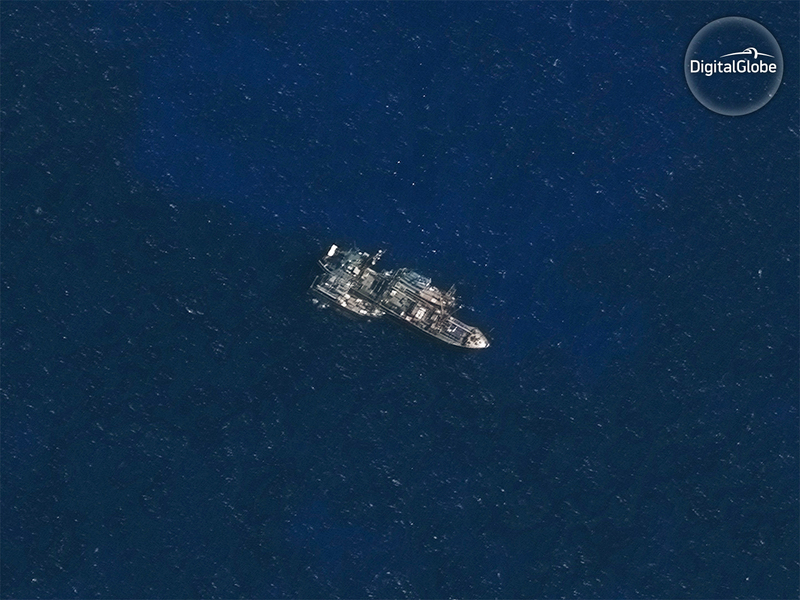 Since we began our efforts to target imaging satellites on reefers, we have turned up several similar “dark” fleets of fishing vessels in other parts of the Indian Ocean and the Atlantic. Combined with AIS data, we are able to flesh out an even more complete picture of what these vessels are doing. In the case of the Leelawadee, AIS-derived tracks over four years indicate that she has made repeated trips between Thailand and an area inside Papua New Guinea’s exclusive economic zone known as The Dogleg, a poorly monitored, remote region rife with suspected illegal activity. Our data reveals many instances in which vessels have crossed from Indonesian waters into the Dogleg, likely to transship their catch. On July 29, 2015, the Leelawadee rendezvoused for many hours with an unnamed fishing vessel broadcasting an irregular AIS number not tied to a vessel identity. Then in November 2016, both vessels met again, this time on the Saya de Malha bank. They spent several hours together, indicating a possible transshipment. That rendezvous occurred hours after we captured the photograph of the Leelawadee with two “dark” vessels tied alongside, and right before she left the area on a northeasterly course back to port in Thailand. Track of the Leelawadee (red) and an unnamed fishing vessel (white) rendezvousing in Papua New Guinea waters in July 2015, then again on the Saya de Malha bank in November 2016.